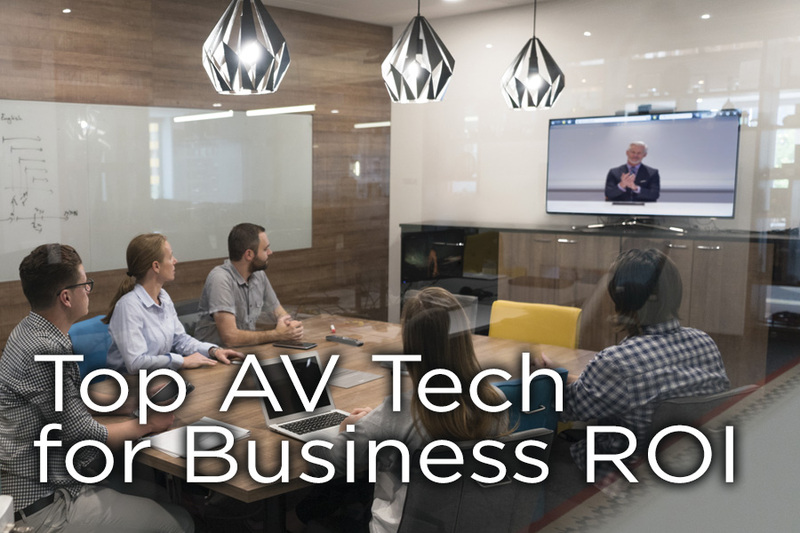 This is the first in a three part series that reviews audiovisual technologies that will save the most time and money for business communications and collaboration. If you would like to download the entire white paper with all three parts, please click the button below. Compared to the ease of upgrading many other modern technology devices, the experience of modifying AV systems produces unique challenges. When so much can be done at the touch of a button in a browser window or through a mobile app, it can be frustrating to realize that AV equipment requires its own specialized connections, cabling, distribution, and control systems making expansion difficult and expensive. New innovations in AV technology are eliminating those frustrations by adopting the efficiency and robustness of IT technologies. Where audiovisual upgrades once required dedicated cable pulls for VGA or HDMI and the acquisition of proprietary AV distribution equipment and control systems, the latest system designs feature flexible AV over IP solutions that can reduce equipment costs by utilizing existing infrastructure. Improved efficiency begins with the cabling. A single Cat5e/6 cable can carry dozens of video, audio, and control signal paths. Further, by setting up an AV system on an IT network, it’s possible to implement IP-based signal distribution for delivering audio and video sources to output devices. Then the entire networked system can be controlled via a standard web-based interface. An AV designer can create a custom GUI for use on a web browser, tablet, or mobile device. Once integrated onto an IT network, AV systems feature the scalability and flexibility required to grow and change with evolving user needs and room environments. Future upgrades will be more in line with what the IT department is used to rolling out, compared to the more disruptive construction work that would have been required when new AV-specific cable was pulled in the past. Less downtime is an added benefit of an AV over IP system, which can be centrally managed for optimum performance and ease of operation. Networked control of systems means that changes can be made remotely, so user queries can be addressed swiftly from anywhere. A projector or video display can be powered on, projection screens lowered, and audio systems checked or adjusted, all via SNMP. Each piece of AV hardware on the network can be accessed to discover what is occurring operationally, or what changes need to be made to resume use. Even the classic question, “Is it plugged in?” can be addressed through remote power status verification. The networked management of rooms and audiovisual equipment increases efficiency and reduces costs—not to mention lowering the likelihood that IT personnel will have to drop everything and travel physically to a room to make adjustments. Additionally, these tasks can be performed within the applications preferred or developed by operators on-site. Where formerly a proprietary solution would require a separate control interface, now operation of all AV equipment on the network can be merged into one control window. When so many AV systems must be monitored across buildings and campuses, with more rooms coming online all the time, the flexibility and scalability of AV over IP systems is a real boon to business. But the ability to manage that equipment from one centralized location brings even more long-term ROI as operations costs are reduced and room use is maximized. Less downtime, more remote capabilities, and plenty of scalability and user customization options are moving AV user experiences closer to the true efficiencies of networked technologies. HDMI introduced a standard protocol for carrying video, audio, and control between AV devices. While it made connecting devices at home easier, in an office setting it was still another cable that needed to be run and required control devices for distribution. HDMI cabling can be an expensive and bulky way to connect AV devices. The cost per foot is typically 300% more than network cables and is more difficult to install. Moving AV signals from HDMI to IP eliminates the cost of separate control devices for HDMI distribution. In most cases, AV over IP solutions will work on your existing IP network and eliminate the cost of running separate AV cables.